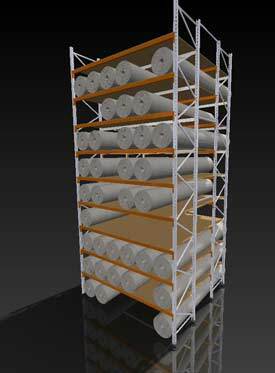 Carpet racking or cylindrical bulk store, is a great solution for warehouses that store and vinyl, carpet, fabric, wrapping material, garage doors and other product that is cylindrical in shape. It is an innovative solution that allows for maximum horizontal storage of product with minimum floor space used. The racks are configured in a way that allows for you forklift spike to pick up the roll and let it enter the whole way into the rack system. We put board throughout the depth of the rack to ensure there isn’t any places that the carpet/product can snag, which prevents damage to your product. Normally the racks are 3600mm deep because that is the standard depth of carpet rolls, but this can be easily adjusted to suit specific jobs. The amount of levels per bay and weight loads per level is also up to you. If you want light or heavy duty shelves we will supply based on your requirements. Our system is a classic pallet racking derived system that allows for full flexibility and adjustability, we will work with you to get the best solution for your warehouse. The same goes for how high you want the racking to go, its actually not limited by the racking system, its limited by your fork truck and roof height. It’s a great solution for your storage needs, that is customised to do the exact job you want for minimal costs of warehouse setup. If you would like a price on a racking system give Macrack a call on 1800 048 821 and we will work something out for your warehouse. We will even come to you and give you a warehouse layout free of charge.